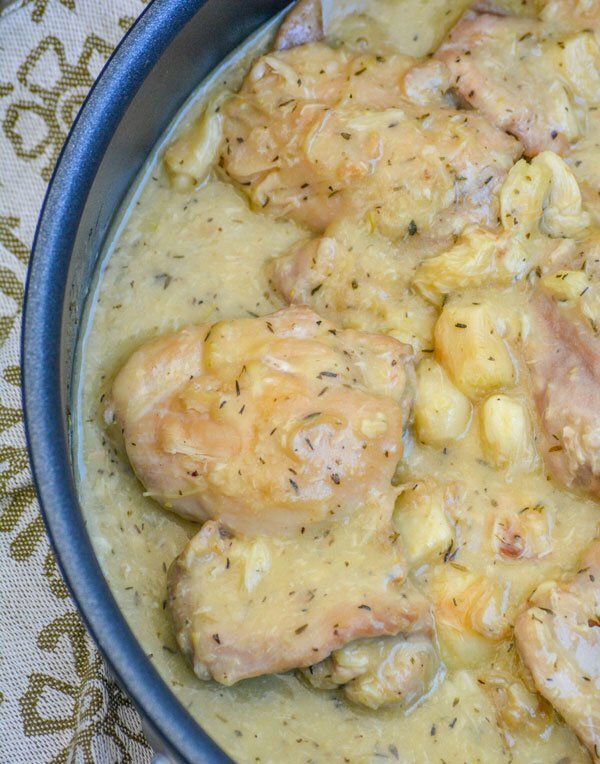 Rustic Pan Seared Chicken Thighs with Garlic Gravy are the solution to all your ho hum chicken and gravy problems. 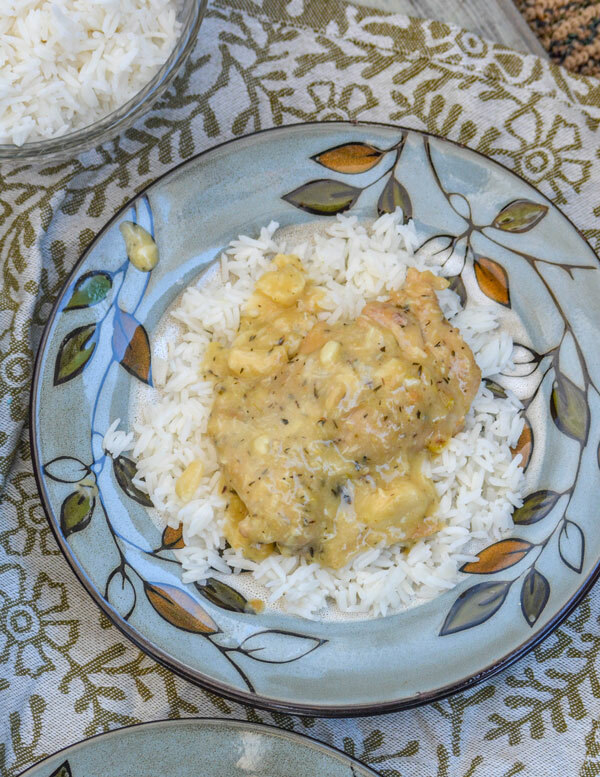 Perfectly seasoned, seared chicken thighs are simmered in a rich, garlic & thyme infused gravy. It’s a dinner dream come true, especially since it’s easy enough for any level of home cook to accomplish. Gravy is seriously the sauce of life. It’s amazing. Love the stuff. There has even been a time or two when I’ve been introduced to one that’s so delectable, I’ve seriously considered pouring it in a cup, popping in a straw, and drinking it straight. Ok, maybe I shouldn’t have admitted that? I did say considered though. There was enough modesty in me that I didn’t actually go through with it. Of course, that could’ve also been because there was an audience. Maybe. It’s a family problem though, probably hereditary although my mother manages to show a lot more restraint in that regard than my sister and I do. We’ve narrowly avoided an all out war over this liquid gold at family functions and holidays over the years. Narrowly. I’m pretty sure I caught my little sister with her fork clenched in a white knuckled grip, and decided against another scoop. Pretty sure she’d have forked me if I’d gone ahead and went back in for more. I can’t really blame her though, our mother makes the best dang gravy this side of town- and my sister’s is almost just as addicting. Only thing missing is the ‘made by Mom’ factor! And all was right on my gravy train, until the day I discovered garlic gravy. Mind = Blown. I kid you not. That stuff was like gravy straight outta Heaven!! 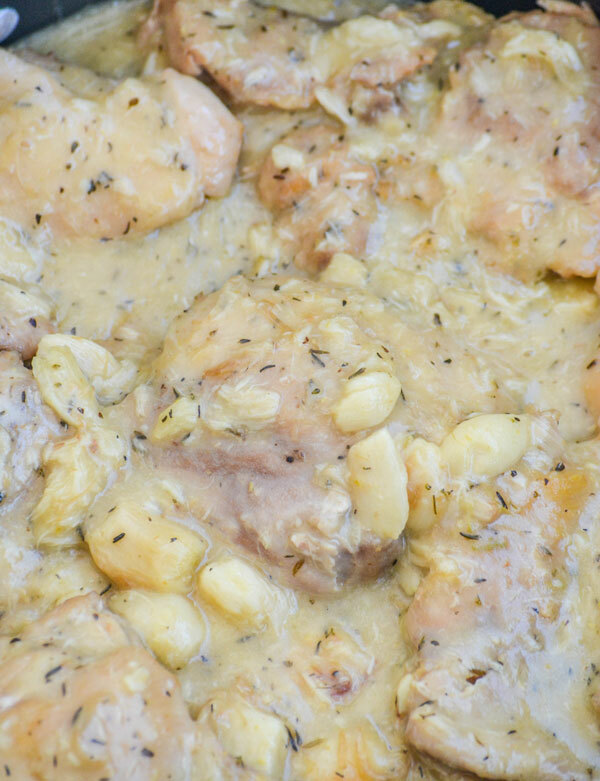 It’s still one of my top 3 favorite gravy recipes of all time, especially when made in this Rustic Pan Seared Chicken Thighs with Garlic Gravy recipe. 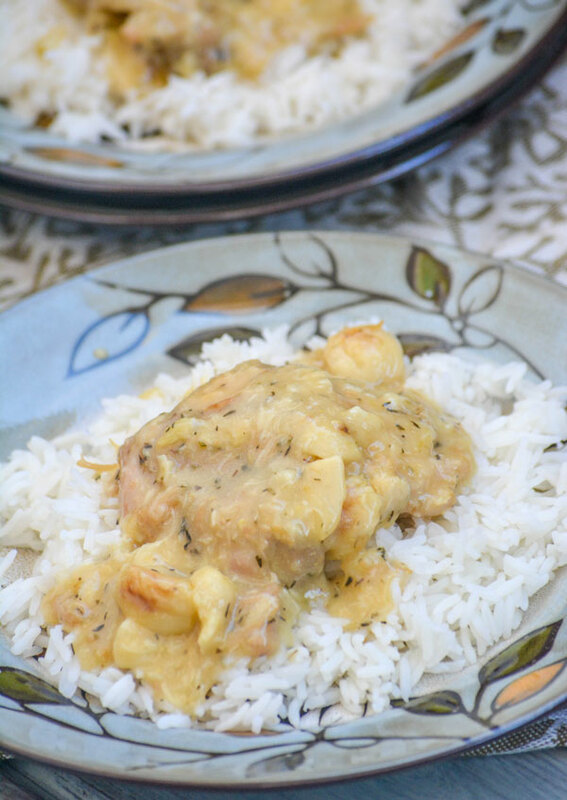 Are you craving chicken and gravy? Do you shy away from it because it seems hard, or at least out of your comfort zone? 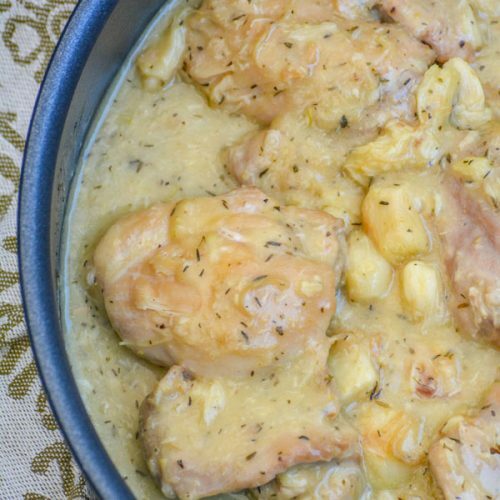 Don’t walk, run toward the light I’m shining in your lack of homemade chicken & really great gravy darkness- because this recipe for Rustic Pan Seared Chicken Thighs with Garlic Gravy is the best thing that’s every happened to your taste buds. 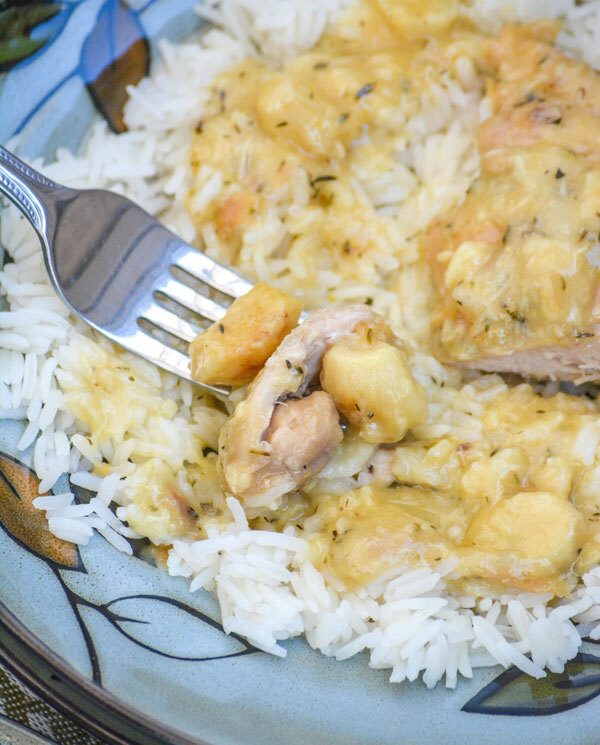 Satisfy that craving with perfectly seasoned, seared chicken thighs swimming in a rich, thick gravy with savory bulbs of golden garlic and notes of thyme. It’s a meal fit for a king, and easy enough to grace any supper table. Rinse the pieces of chicken, use paper towels to dry them completely, and transfer them to a plate or platter. Liberally salt & pepper each piece. Add the oil to a dutch oven, or cast iron skillet, and heat over medium high heat. When hot, add the chicken to the pan and cook about 8 minutes, turning often to prevent both burning and sticking, until all the pieces have been nicely seared on each side. Use tongs to remove the chicken from the pan and transfer it to another clean plate or platter. Set aside. Turn the heat down to just a hair under medium, and add in the garlic. Cook, stirring occasionally, just until the garlic's begun to brown- about 2-4 minutes. Whisk in the flour until evenly combined and the gravy's smooth. Transfer the chicken back to the pan, cover, and bake at 400 degrees for 15 minutes. Carefully remove the dutch oven from the oven, place on a burner over medium high heat, and remove the chicken to another clean plate or platter (last time, I promise). Add the wine, and stirring often, let the gravy simmer for about a minute. Add the broth, thyme, and salt & pepper, to taste. Stirring, so that everything's evenly incorporated, reduce the gravy to a simmer and continue cooking until thickened. Stir in the butter. Once completely melted and the gravy's smooth, return the chicken to the pot to heat back up. 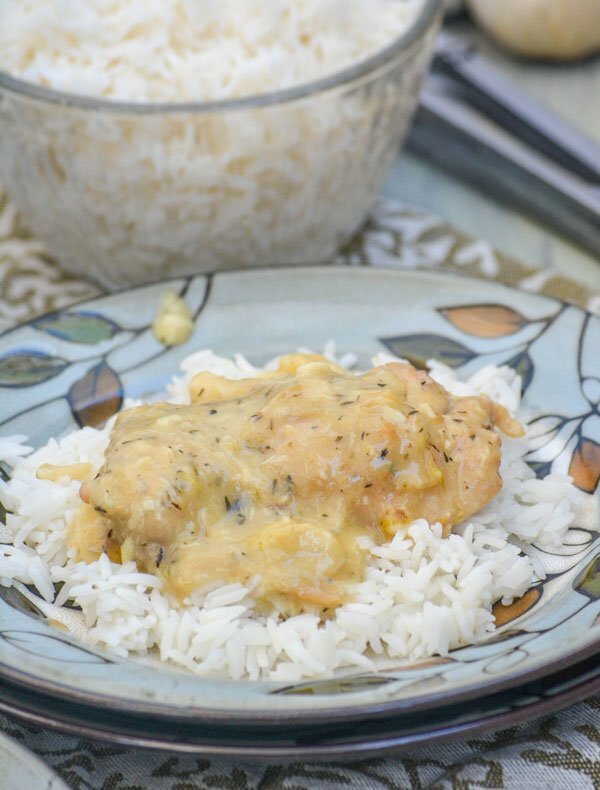 Serve chicken over a bed or warm white rice or creamy mashed potatoes. Spoon the gravy and garlic over top. My mouth is watering!! I am feeling hungry now! Thanks for sharing at Fiesta Friday party! Gravy always gets my mouth watering too, lol. Season the gravy with salt and pepper to taste. Serve the short ribs over mashed potatoes with a ladle of gravy over all. Yep, exactly as suggested! As for short ribs, I’d probably do those in a tomato or wine based gravy as opposed to chicken broth. Ohhhhhhh, that’s a good question Donna! Let me know if you try it out and how it turns out!! In number four do you mean until the roux is smooth? How is it a gravy when all you have combined is the flour and garlic from the original pan? Is there supposed to still be oil and maybe leftover chicken liquid? And wouldn’t some of the roux come off with the chicken after you put it back in the lab and cook then remove? I really want to make this but am confused by the instructions. Thanks! There will be plenty of the chicken juices to form the base of the gravy. I’m sorry if I didn’t spell that out! No worries, it’s really an easy recipe. It’s one of those come-together around everything else while cooking kinda roux’s.